OMAHA AS SLAYER OF M.
OMAHA, NEB., -- Jan. 11. -- John Adams and Earl Brown, two youthful alleged desperadoes who were arrested by Detective Mitchell and others on December 10 for alleged connection with a series of holdups and one shooting affair, are wanted at Kansas City on murder and robbery charges. They were identified this morning by several victims who came here from Kansas City. This morning three victims of recent holdups in Kansas City arrived. They were S. W. Spanglerr, Al Ackerman and Joe Shannon. With them were Detective Wilson, Assistant Prosecuting Attorney Norman Woodson and Cash Welch, proprietor of a Kansas City messenger service. Ackerman identified Adams as the youth who killed Spangler's father November 23 while attempting to hold up the latter's saloon. they said Brown resembled the companion of Adams on that occasion. On December 7, E. S. Ashcroft, of 1811 Chicago street, Omaha, was held up at Seventeenth and Chicago streets by two young men, who ordered him to throw up his hands. He refused, and started to run. they fired two shots at him, one taking affect in his right arm. Two nights later Marvin Kohn, a young business man, was held up by the same two youngsters, it is alleged, at Twenty-fifth avenue and Douglas streets, and robbed of $5. Next Day Detective Mitchell located Adams and Brown in a lodging house at Fifteenth and Capitol avenue and arrested them on suspicion. Kohn positively identified them and they were held to the district court on a charge of robbery under $500 bonds. They are now in the county jail. When arrested the two young men were in bed, although it was then noon. In the sole of one of their shoes was secreted considerable money and a revolver was found wrapped in a shirt and hidden in a dresser drawer. 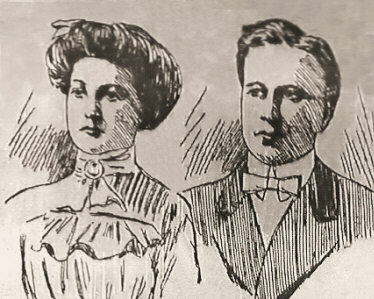 The murder in Kansas City with which Adams is charged occurred shortly after midnight November 23. M. A. Spangler was killed and his son, Samuel, had both arms broken. Ackerman was present at the time. Young Spangler and Ackerman were confronted at the city hall this morning by a group of ten prisoners, among whom were Adams and Brown. Ackerman immediately picked out Adams as the man who killed the elder Spangler. They also said that Brown looked like the other holdup. Joe Shannon, a Kansas City politician, who was held up and robbed of his watch and $48 shortly before the murder, positively identified Brown as one of the desperadoes. He says the second man looked like Adams. George H. McCray, a Kansas City business man, identified Adams and Brown as the two robbers who held him up and robbed him of $2. He says that Brown's mask dropped from his face and that he therefore got a good look at him. Cash Welch, the messenger service man, identified the two young men as having worked for him during the robberies. It is thought that Adams will be sent to Kansas City to answer a murder charge. Brown will probably be also sent there on a robbery charge, since the Missouri cases are even stronger than the Omaha ones. That Charles T. Galloway, who murdered Deputy Sheriff Charles Lukens of Wyandotte county, Kas., December 8, was shot and killed after he had surrendered and had been placed under arrest a few hours after the commission of his crime, was testified by witnesses at the coroner's inquest held yesterday morning. According to the testimony of several officers who participated in the spectacular attack which led to the killing of the cornered slayer, Galloway was unresisting and disarmed when the fatal bullet was fired into his abdomen. "Detectives Wilkens, Downs and myself went upstairs to search for Galloway," testified Detective Ralph Truman. "We found him in a closet in the back part of the house. We called to him to give up. He answered with a valley of shots -- I don't know how many -- and we began shooting at him. "After we fired a good many shots he called out to us and said: 'I'll surrender.' We told him to open the door and come out. He came out and we got him by the arms and led him into an adjoining room. There were then several shots fired, by whom I don't know, but at the last shot Galloway fell. Upon examination we found he had been shot through the body." "Was Galloway disarmed when shot?" Trueman was asked. "I believe he was," he replied. "Was he unresisting at the time he was shot?" "Yes, he had surrendered," responded the witness. "What condition was Galloway in when you brought him out of the closet?" "He was all right, as far as I know." Detective J. W. Wilkens testified that he and Trueman led Galloway from the closet in which he had been hiding, and that he called to the crowd to quit shooting, but it seems that in the excitement of the moment, not all could realize that Galloway had surrendered. Wilkens said when the fugitive came out of the closet he assumed a crouching attitude and that he had his hands up in the air as a mute signal of surrender. Wilkins also said that the bullet which penetrated the sleeve of his own overcoat was the same one which killed the prisoner. 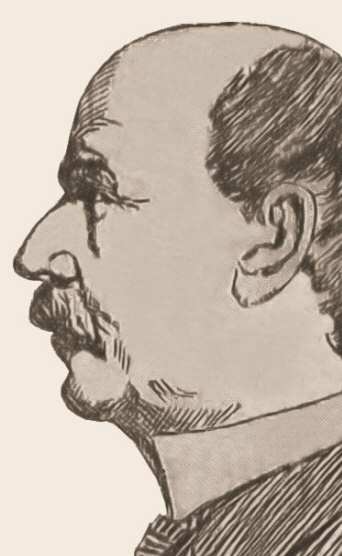 Detective David H. Oldham, in his testimony, said that earlier in the evening Inspector Boyle had been communicated with over the 'phone, and he had advised that a heavy guard be placed around the house in which Galloway had barricaded himself, and no attempt be made to capture the man until morning, when he would probably be in a less dangerous mood. This course was decided upon, but at about 11 o'clock, some one, Oldham did not know whom, yelled out that he would go up and help get the fugitive, whereupon several officers announced they would take the lead. Within a moment, the witness said a squad of officers were inside the house. They searched the down stairs rooms first, and then proceeded with a rush upstairs and soon afterwards a fusillade of shots was heard. Many other witnesses were examined, but no one knew who fired the shot which killed Galloway. The coroner's jury returned a verdict to the effect that Galloway met his death as a result of a gunshot wound inflicted by some unknown person. Neighbors entering the home of Joseph Campbell, 2952 North Seventeenth street, Kansas City, Kas., at 9 o'clock yesterday morning found the dead bodies of Mr. Campbell and his wife on the floor of the stuffy little room which served the double purpose of sleeping and living room. Clasped in the right hand of the man was a revolver. He evidently had murdered his wife, then committed suicide. 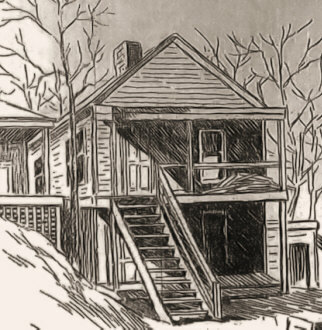 Crouching down against the bed in one corner or the room, benumbed with cold and fear, was the little white robed figure of a boy, 2 years old, whose crying through the night and early morning attracted the attention of the neighbors and led to the investigation which resulted in the finding of the bodies. Charles Phillips, 18 years old, who lives next door to the Campbells, and C. R. Lumsdon, another neighbor, were the first persons to make the discovery. The sobs of the baby induced the two men to knock at the door. Receiving no response after repeated knocking they broke the lock and opened the door enough to obtain a view of the interior of the room. The body of the woman was almost against the door. She had remained in a kneeling posture, the head to one side. A bullet had entered below the left breast, passing entirely through the body and lodged under the skin on the right side. The man lay in almost the same position against the south walls of the room and behind the woman. His arms were folded across his breast and the revolver was held tightly against his body. The bullet had passed through the heart. Campbell was a baker. He was 32 years old. He was married about three years ago in southern Missouri, where he became acquainted with the girl, Miss Myra Matthews, who became his wife. She was 20 years old. Although worn and haggard she bore the traces of having been beautiful. Insane jealousy on the part of the husband is the reason attributed for the murder. The bodies were viewed by the coroner and taken to the undertaking rooms of Fairweather & Barker. The killing of the innocent wife and the subsequent suicide of the murderer was but the logical climax of the events which mark the life of Joseph Campbell. Although for weeks Campbell has spoken of domestic troubles, even going so far as to consult Chief of Police W. W. Cook, and on numerous occasions threatening to buy a revolver and "end it all," it is believed by those who knew him best that these troubles and the consequences had their inception in a drug filled brain. That the murderer had been addicted to the use of morphine for many years is known, in fact so common was this knowledge that for at least fifteen years he has been known to hundreds of persons in Kansas City, Kas., as "Morphine Joe." A bottle half filled with the drug was found on a chair near the bed. The police are at a loss to determine at what time the tragedy occurred. The family of William T. Kier, 2950 North Seventeenth street, say that the Campbells were heard pumping water from the cistern as late as 9:30 o'clock last night, but they heard no shots. The family of William Brocket, whose rooms are over those of the Campbells, did not return until about 11 o'clock at night, and no shots were heard by them. Daniel Galvin, a carpenter, living a few doors north, said that he heard a shot around 10:30 o'clock but thought nothing of it. CHILD AND DOG WITH DEAD. A scene of utter desolation was witnessed by the men first entering the room. On every side was the evidence of extreme poverty. The ragged covers of the bed, which had not been slept on, were folded neatly back. A few little, cheap pictures adorned the unplastered walls. Despite the cheapness and the poverty there was the touch of a woman's hand, which transformed the scantily furnished room into a home. The little boy, Earl, crying by the bed where he had stood in the cold during the entire night, and a large dog which stood guard over the dead body of his mistress, were the only living beings in the place of death. The child was hurried to the home of Mrs. C. R. Lumsdon and placed in ht blankets, but the dog growled savagely at the intruders and would not submit to being moved until petted by a neighbor whom he knew. THE CAMPBELL HOME, KANSAS CITY, KAS. The news of the murder and suicide spread rapidly over the neighborhood and hundreds of persons gathered about the house. The police were notified and after the bodies had been taken away a guard was set about the house to prevent persons from entering. The orphan boy will be cared for by his father's mother, Mrs. James B. Grame of 2984 Hutchings street, Kansas City, Kas. "The news of this awful deed came as a shock to all of us," said Mr. Grame last night. "The fear that something like this would happen has been in our minds for years." The awful condition of Campbell, crazed by drugs, has added twenty years to the age of his mother, who has clung to him through all his troubles. "It is a matter I cannot discuss, but harsh as it may sound, it is better for the world and better for himself that his life is ended. The thing that hurts me the most is the thought of that poor innocent girl a sacrifice to his drug crazed brain." Persons living in the neighborhood say that Campbell has made numerous threats against his wife. Mrs. M. J. Cleveland, 2984 Hutchings street, said yesterday that Campbell came to her home Saturday morning and told her that he was going to get a gun and kill the whole outfit, meaning his wife. Practically every person living near them were afraid of the man and it was said that he constantly carried with him a gun and a butcher knife. He had recently secured work at the Armour packing plant. Bonnell Case to Be Changed. The charge against Mrs. Sadie Geers in connection with the shooting of Harry Bonnell Sunday, will be changed today from felonious assault to second degree murder, as a consequence of Bonnell's death this morning. Mrs. Geers was arraigned Monday in Justice Ross's court on the first charge, and her preliminary hearing set for Friday. This charge will be dismissed today. Mrs. Geers is in jail.